Holy smokes, she has a ton of teeth, I thought we were doing okay with Colby only having two!! I love when babies get teeth, Mae's are so cute! She really looks like a new baby with her pretty pearly whites! So cute! The pic is awesome! Did you take that using your new lens? What kind is it? You've got the same camera I do, right? 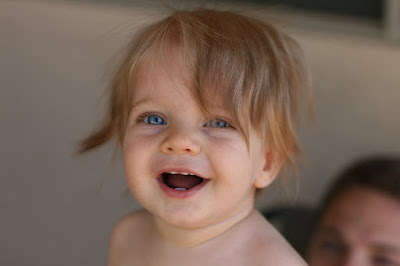 cute teeth, cute hair, cute baby!